It’s either a sign of MB’s personal ignorance of the art world or ignorance within Western countries generally of Russian history and culture (MB is not sure which), that he had never previously heard of the Tretyakov Gallery in Moscow until his Moscow visit of a few days back. The gallery houses the largest collection of Russian art in the entire country and was originally donated to the State by an art-collecting merchant called Pavel Tretyakov (in 1892). Tretyakov’s donation comprised some 2,000 works of art at that time, but the collection has now grown to some 150,000 pieces, including some sculptures. The gallery itself is overwhelming, as are many of the paintings which are huge in physical size. MB got lost a number of times in the gallery such is its extent, and its labyrinth layout. The paintings generally portray famous characters or aristocracy figures from Russian history, famous moments of Russian history, and many religious themed paintings. MB gives you all one such painting from the gallery, appropriate for this week’s photo challenge from many aspects MB is thinking, which depicts the arrival of Jesus to some of his followers. MB heard the full description of the painting on his gallery audio guide but sadly forgets most of it by now. MB remembers that some of the characters have just emerged from the Jordan River following their baptism by John The Baptist, and four of the future apostles appear on the left side of the photo (in beards & one with red hair). MB will post a follow-up post on the Tretyakov Gallery in the coming days. Big thanks to Russian friend NK for organising the visit and many others over the weekend. MB Os U! MB will henceforth give a regular ‘Sunday Shot’ to followers, which will be slightly abstract in nature. He will say no more. It’s not often you will see an elderly Muslim gentleman standing beside a Western lady with a low neck-line. The lady has some Arabic influence however, as she is sporting an intricate henna tattoo on her face & neck, almost like a veil, which must please the Muslim gentleman no end! There are not so many good places to wander about with your camera in Qatar. But the Souq Waqif is one of them and is one of MB’s favourite spots in the locality. Lots of interesting subject matter floating around down there, and being a bit of a tourist haunt, nobody takes much notice of camera geeks doing camera stuff. Just before Christmas, MB was wandering around the Souq and one of the Souq artists caught his eye. Or rather, 2 of his sketches caught MB’s eye. Interesting that both are of young girls and both come from different fields of ‘Art’, namely Photography & Painting. MB notes that many in the ‘Art’ world do not consider ‘Photography’ part of the world of ‘Art’. But that’s a discussion and debate for another day. The sketch top right is a representation of one of the most famous photographs in the history of photography, called – Afghan Girl. It appeared as a cover photo of National Geographic magazine in June 1985. The photo was shot in a Pakistani refugee camp one year earlier, and the photographer never took note of the girl’s name at the time. Her green eyes and the intensity of her stare were striking, and the sketch, with respect, does not do justice to the original. The photo, by Nat Geo photographer Steve McCurry, was shot with a Nikon film camera, and is often compared to De Vinci’s painting ‘Mona Lisa’. McCurry tracked his subject down in 2002, in a remote village in Afghanistan. The subject of the shot (Sharbat Gula, of Pashtun ethnicity) was unaware of the fame of the photo, albeit she remembered the photo being taken, as it was one of only three times in her life that anyone had taken a photo of her. The search for her became a TV documentary and also featured in Nat Geo magazine in April 2002. The sketch to the left of ‘Afghan Girl’ is a sketch of one of the most famous paintings in the world, called – ‘Girl With a Pearl Earring’, by famous 17th-century Dutch artist Johannes Vermeer. It sits in a museum in the Hague since 1902. Another deadly shot by MB! A photo that would grace the cover of a book, magazine or music album. 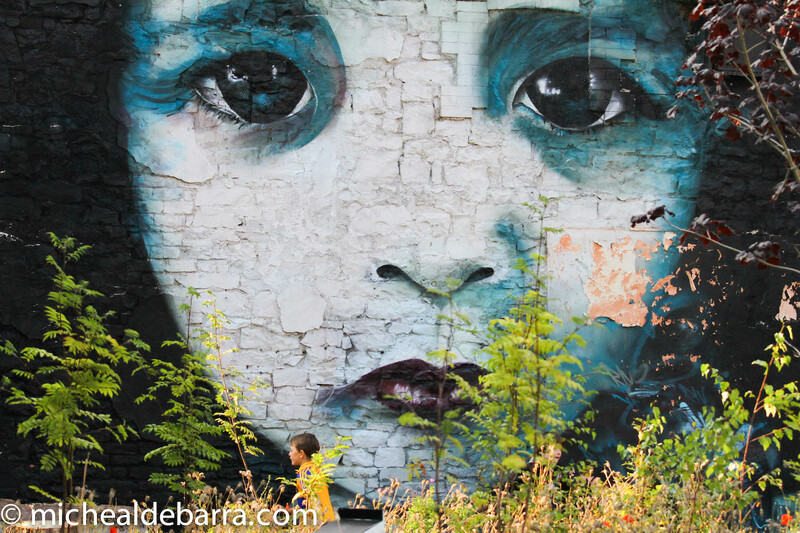 MB has selected a wall mural from Thomas Street, Limerick, South West Ireland. Taken June 2014 during trip home.